The hype is gone. The tech mantra has switched from “revolution” to “evolution,” and Kellogg School experts show how business leaders can extract real value from innovation. Spring was on its way to Silicon Valley, and in March of 2000, when Kellogg School Professor Tony Paoni and his group of two dozen TechVenture students landed there for the field research portion of the popular Kellogg technology course, that meant the air was filled with the scent of camellias — and the optimism that came from a technology industry still riding the Internet boom. If back then firms were shedding jobs, the Valley still buzzed with ideas, pitches, promises and money. Revolution was a cliché tossed around by marketers who intended to sell pet food and furniture through wires connected to computers. Rules were changing, paradigms shifting and the 24 Kellogg students emerging from their hotel into the cool morning piled into vans that would take them to their first appointment: A start-up called Parachute, a firm built around the concept of charging retailers $39.95 to deliver luxury goods. 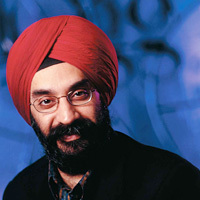 As part of TechVenture, an intensive hands-on Kellogg course established in 1998 to give students a behind-the-scenes look at premier technology firms, Paoni’s group formed part of the 150-strong Kellogg contingent participating in the course, co-taught by Professors Mohanbir Sawhney and Ranjay Gulati. A few days before the 2000 trip, Paoni confirmed an exciting agenda for his students. Finally, the CEO answered the door with some unpleasant news: The cavernous office sat empty, all the employees sent home. The company had gone out of business. Parachute had burned through $12 million of venture funding, mostly on an expensive software program and a fleet of 25 customized PT Cruisers it planned to use to make deliveries. But the company had delivered fewer than 100 items, one of many facts the CEO shared with Paoni and his students during their sobering visit. One of things he learned is this: Infatuation with the machine — the black box, silver-bullet magic solution — can create critical errors that leave CEOs alone in their warehouses. The Parachute executive was hardly alone in pondering his company’s fate, though. In the post-boom tech world, his tale became an Everyman saga etched in silicon. What’s consistent in these accounts is the seemingly inexplicable demise of a company founded on a good idea. Kellogg School scholars are quick to point out that having a good idea is like having a fancy tool, but they caution that the tool cannot substitute for a sound business model and skilled execution. During the Internet boom, companies snatched up new technologies, assuming that these tools alone would transform their businesses. They were wrong. “Companies got scared they were going to be left behind, and that all this new technology being created as a result of the Internet going mainstream would somehow give them a competitive advantage,” says Sawhney, the McCormick Tribune Professor of Technology and director for the Kellogg Center for Research in Technology and Innovation. Companies now have too much high-tech gear. Their challenge today is linking what they have to a viable strategy, contends Sawhney, who teaches technology marketing and is co-author of The Seven Steps to Nirvana: Strategic Insights into eBusiness Transformation. He is also one of several Kellogg faculty members engaged in fulfilling th]e Office of the Dean’s vision to bring customized executive education to corporate partners such as Microsoft, Boeing, and UBS, Switzerland. “Technology is drugs, bugs and plugs,” Sawhney quips. One could name a thousand examples and still not be done with the parade of marvels: space-age tools that allow humanity to leave its Neolithic past far behind in favor of the utopian future. This constant evolution, however, is not without potential hazards — one reason why some industry observers, including Erik Davis in his text Techgnosis, liken technology to the Trickster figure, the ambiguous creator-destroyer-prankster that appears in many cultural myths. Just as fire always requires someone to tend it, so too, say Kellogg experts, does technology. “Technology is a marvelous enabler, but we must keep our eyes on it to ensure we direct the innovation in ways that maximize excellence,” explains Kellogg School Dean Dipak C. Jain, a thought leader in marketing and new product innovation. Jain insists that executives should not embrace technology simply because it’s there, but for its potential to leverage efficiencies and cultivate closer customer relationships. Jain notes the Kellogg School’s achievement in developing its robust Technology Industry Management curriculum to provide both specialists and general managers with the skills they need to manage and market technology. The underlying assumption is that technology now impacts every company. Just as the full-time MBA program has changed with the times, so has the Kellogg Executive Education curriculum. It includes unique courses, such as Driving Strategic Results Through IT Portfolio Management, that give managers a financially grounded way to optimize technology investments. The course takes the mystery out of a process that can seem driven by mania, rather than business fundamentals. Too often during the Internet boom, Jain believes, firms focused on speed, getting to market first — often a legitimate goal, but hardly the only consideration — and so let ideas run unfettered by anything other than a vague strategy. Seeing the road ahead while traveling at the speed of fiber optics isn’t easy. If any quality defines technology and innovation, it’s the velocity with which markets change as they adapt to increasingly demanding customers. It’s a condition that Jain and Kellogg School marketing guru Philip Kotler have termed the “nanosecond culture,” adopting the expression from futurist Jeremy Rifkin and employing it within the context of marketing leadership. “If they act smart, companies can achieve a strong competitive advantage by performing faster. 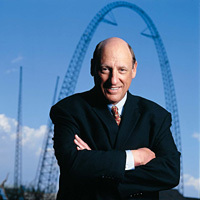 They must become turbomarketers, learning the art of cycle-time compression and speed-to-market,” says Kotler, the SC Johnson and Son Distinguished Professor of International Marketing. But if speed is of the essence, it can also kill. The dot-com graveyard is littered with companies done in by bad initiatives conceived and executed under pressure. Those who have weathered the storm have done so by balancing the need for speed with powerful insights into their customers’ needs. Pereira echoes what Kellogg School thinkers believe: There’s always pressure to innovate, and usually that translates into greater complexity of products or services. What really matters is how these offerings match customer needs. Kellogg authorities note that the tech industry craves novelty. There’s a mercurial quality to technology, and a slick Trickster promise that life will get much better if we just flip this switch, press that button. But technology often is adorned with rhetoric that accents its promise, rather than its reality. 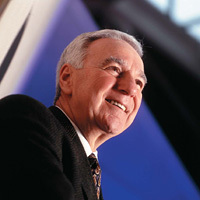 C. Gerron Vartan '67 says customer centricity is fundamental to success. 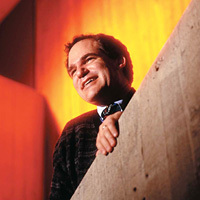 “We have to look at technology for what it is: A set of machines, industries or abilities, rather than throwing this blanket term ‘technology’ over everything that valorizes the ‘new new thing’ without necessarily understanding it, or how we want to use it,” says Kellogg Marketing Professor Robert Kozinets, an anthropologist by training, whose research considers “technocultural consumption,” the intersection of technology, marketing and postmodern culture. Even technologies often touted as winners — Customer Relationship Management (CRM) platforms or Enterprise Resource Planning (ERP), tools that enable firms to turn mountains of data into useful information that lets them better understand their business and their customer — won’t work miracles in a vacuum. “People have gotten sick of the overpromise, underdeliver,” says Gulati, the Michael Ludwig Nemmers Distinguished Professor of Strategy and Organizations at Kellogg. Gulati, along with Paoni and Sawhney, is editor of TechVenture: New Rules on Value and Profit from Silicon Valley as well as Kellogg on Innovation and Technology. In his strategy implementation course, he teaches Kellogg students how to move beyond hype to execute strategy that uses technology to create intimacy with the customer. See the related article: "Teamwork takes a virtual twist"
During the boom, businesses did expect technology to solve big problems, and create bigger fortunes. A company that grew infatuated with its technology often forgot the needs of the customers it was supposed to serve. Why? Because of the giddiness created by the stock market’s rise, but also because the people driving the creative process, often engineers and scientists, were unfamiliar with the marketing insights that could have helped them understand their customer. Kellogg alum C. Gerron Vartan ’67 is president and CEO of Bay Area-based Aegis Partners, a marketing consulting firm that specializes in the technology industry. 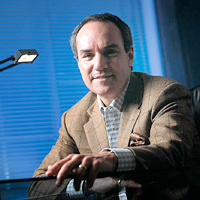 Vartan was one of those involved with creating the original 1984 brand strategy for Microsoft. Since then, he’s worked with many tech firms to develop strategies to connect companies with their customers. It has not always been easy. 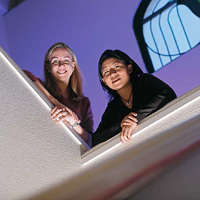 Susan Moseley '00 (left) and Jennie Tsai '00 keep Danger.com in the fast lane. To Vartan, the dot-com crash was less a product of e-commerce quirks than a byproduct of the culture of established technology companies. “It’s in the DNA of many of these firms to think that building more and more features into the products will win the day, while having little regard for customers’ views or competitors’ alternatives,” he says. Gulati says that a company’s culture and organization proves key. While recent studies report that about 60 percent of CEOs polled believe their companies are selling solutions, he believes that many executives confuse solutions with the bundling together of multiple products or services under a single offering, usually at a discount. The first step toward offering solutions is getting multiple functional and product areas inside the firm talking to one another. The high expectations swirling around dot-coms — and the subsequent rapid demise of many of them — didn’t come as a surprise to J. Peter Murmann, Kellogg assistant professor of management and organizations, who has studied the adoption of technologies from radio to synthetic dye. Kellogg alum Gil Penchina ’97 is responsible for corporate development at Palo Alto-based eBay.com, one of the Internet success stories to date. Penchina is also a self-described Silicon Valley history buff whose views on the dynamics of his industry echo Murmann’s. He notes that the latest shakeout is nothing intrinsically new, and cites various computer, software and biotech booms as evidence. Sawhney perceives other distinctions between so-called old and new economy models. “Because the tech world involves more modular parts, the role of partnerships, alliances, networks and ecosystems becomes critical in technology markets, and managing all these elements is a critical skill,” he explains. Branding, too, is conceptually different among technology firms compared with their more traditional counterparts. Tech companies tend to emphasize the corporate brand, rather than individual product brands, since the products change so rapidly. In addition, Sawhney sees differences in how technology firms do market research. Customers’ needs are often unclear, and this inability to articulate grows more pronounced in the high-tech sector. So marketers must excel at understanding these needs, relying significantly upon direct, ethnographic research. This “contextual inquiry” is one Sawhney stresses in his classes. “The key is developing value propositions that stand the test of time while devising platforms that can be flexible over time,” he says. The dynamics of the tech industry demand skills “built for speed,” but also require managers to understand the same business fundamentals as in any industry. Susan Moseley ’00 agrees that the basics of business — “Phil Kotler’s Four P’s” —still apply in her job as director of marketing communications for Danger.com, a Bay Area firm in the wireless communications space. Founded in January 2000, Danger recently landed $35 million in Series D funding for its Hiptop solution, a wireless all-in-one device the firm sells to mobile operators. However, Moseley and fellow 2000 Kellogg alum, Jennie Tsai, Danger’s senior business development manager, note that their industry can’t take too much time pursuing traditional marketing strategies. Similar dynamics apply for Dora Lee ’00. As product line manager at Apple Computer, Lee must ramp up to meet today’s demanding market. Vartan acknowledges the “enormous pressures” under which tech firms operate, and believes the half-life of information will only get shorter. However, he says that too many technology companies got away from the business basics. “The principles of marketing are called principles for a reason,” he says. The unraveling of so many dot-coms so quickly may have led some business students to believe — wrongly — that technology is an inconsequential area of study. While Kellogg School tech gurus once were besieged with pleas from students desperate to take their classes, they now find some MBA candidates shying away for the wrong reasons. For Kellogg Professor Shane Greenstein, an economics expert who teaches strategic management in dynamic markets, his approach to his subject has, paradoxically, remained both static and fluid over the last several years. “My philosophy was to stick to tried-and-true themes, teaching the students frameworks that would last them a lifetime,” explains Greenstein, the Elinor and Wendell Hobbs Professor of Management and Strategy. Greenstein says that beneath much of the buzz about “revolutionary” markets lie some familiar lessons: Strategy involves aligning business organizations with market environments; markets tend to evolve in predictable ways; organizations in these markets tend to behave in particular ways. That said, Greenstein believes information-intensive domains are changing fast and demand leaders versed in classic business fundamentals, but who are able to move quickly in particular niches as they evolve. Similarly, Emily Edwards ’96, who works as an account director for Teradata, a division of NCR, urges Kellogg students to become students of technology and learn how it relates to classic business models. For instance, as brand manager, marketers must understand how data warehouses and data mining work in order to build and maintain effective customer relationships. They must know how to execute direct marketing campaigns using the latest tech tools. 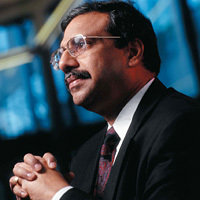 Sunil Chopra, the IBM Distinguished Professor of Operations Management and Information Systems at Kellogg, lists ERP and CRM as two valuable, data-intensive tools that can help companies link their processes across the entire organization, while generating information that results in more intimate customer relationships. However, having the data is just the first step. Kotler agrees, saying that a marketer who doesn’t have a clue about CRM, for example, won’t be able to exploit its capabilities. “That’s why we are insisting in the marketing curriculum that our students become technical too,” he says. The Kellogg School’s technology offerings can be divided into two tracks: horizontal and vertical. The horizontal track is for generalists looking to develop strategic fluency, while students seeking a deeper knowledge can take the intensive vertical track. Among these innovative courses is Professor James Conley’s Intellectual Capital Management. It drives home the need to methodically manage the intellectual assets that result from innovation and branding activities, including protecting a firm’s investment in innovation through copyrights and patents, for instance, that can help sustain competitive advantage. Such courses have made Kellogg a leading-edge model for other MBA schools, but Kellogg has eschewed trends. 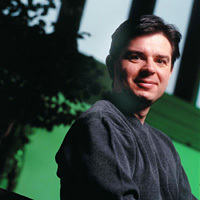 A review of the Kellogg technology curriculum, completed in 2002 by Jeffery, found the school offered a greater variety of technology courses than any of its peers. Students who are especially tech-minded might register for TechVenture, the field-study course that has produced two texts consisting of student-faculty case study collaborations on promising firms and technologies. “Such initiatives are one important way we nurture our students so that they develop their own thought leadership skills,” says Dean Jain. Other innovation-minded students organize the annual Kellogg School Digital Frontier Conference. But even the technophobes among the student body realize that technology is nearly impossible to escape — especially on campus. Before they begin their first day of classes, some students complete online learning modules as a way to sharpen their accounting, microeconomics, math or statistics skills. Once classes start, they discover that class speakers and conference addresses they may have missed are often available on the Kellogg Web site. Catherine Grimsted, associate dean of finance, planning and technology at the Kellogg School, is charged with sorting out which technologies are likely to enhance the student and alumni experiences. Grimsted predicts Internet video will play an even more significant role in the future. Online learning may help Kellogg develop curricula for custom Executive Education clients. For example, a firm might send a handful of its people to Evanston to learn from the Kellogg faculty. Faculty might then travel to the company to teach a second group of employees. But a third group — as many as 5,000 people — could use distance learning to study a shortened version of the course, Grimsted says. Technology will also continue to strengthen the connection between alumni and Kellogg, Grimsted says. The school soon will introduce a next-generation system that allows grads to form virtual Kellogg communities. While Kellogg has always prepared students to be leaders in their fields, using experience to guide future choices, these days there may be few options for some decision makers other than to pave their own way. “When you’re working in high technology, you’re creating your own footsteps because there are none to follow,” says Professor Alicia Löffler, director of the Kellogg Center for Biotechnology. That is especially true in biotechnology, where leaders not only blaze trails, but confront ethical choices — from cloning to the use of stem cells. 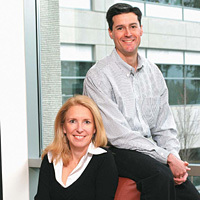 Microsoft marketing executives Mich Matthews (left) and Steve Petitpas have helped create a thriving partnership with the Kellogg School. 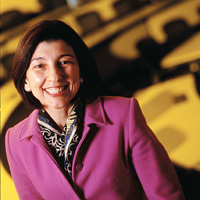 Similarly, the ideas discussed at Kellogg not only affect the school’s students, faculty and staff, but are increasingly having real impact in the larger business world, through Kellogg partnerships with industry leaders and customized Executive Education delivered both in Evanston and around the globe. Perhaps nowhere are the challenges, and results, of this collaboration more visible than at Seattle-based Microsoft Corp., a firm that by its own admission can be resistant to outsiders. When this industry leader wanted to rejuvenate its marketing approach, it turned to Kellogg for the insights to get the job done. “While outsiders may look at us and say, ‘Whoa! Marketing machine,’ internally we’re looking at ourselves and seeing areas that could benefit from a new approach,” says Mich Mathews, corporate vice president of marketing for Microsoft. She and senior management have been “delighted” with the 1-year-old partnership, because of the Kellogg School’s expertise and ability to deliver customized excellence that produces immediate benefits. “Kellogg did not come in here simply with an offer of spotty executive lectures,” Mathews says. “They embraced our business problems in an effort to solve them. This partnership has challenged us and brought back rigor and discipline” into how Microsoft thinks about marketing strategy. The results speak for themselves: Courses such as Doing Marketing @Microsoft have generated some of the very highest executive responses in the company’s history. “With Kellogg, I knew we were not just going to learn in the classroom, but we were also going to learn first-hand about what customer-centricity really is,” says Steve Petitpas, director of Marketing@Microsoft Professional Development in the corporate marketing group. Yet the Kellogg influence has not stopped at the classroom, according to Dave Perry ’88, the Kellogg alum who helped spark the partnership and who says it’s been the most fulfilling project he has ever been involved with. Other Kellogg School partnerships have enjoyed similar success. One was born after a group of Conley’s students completed a project for Motorola, exploring ways the company could find external markets for software and other IT products it had created and used internally. The resulting Motorola Research Scholars Program, now entering its second year, puts selected Kellogg School students to work on a research question of interest to academics as well as managers in the field. hantaram Jonnalagadda, one of two current students chosen for 2002 in a competitive review process, explored the concept of “orphan assets” — intellectual property that is ignored because it does not coincide with a company’s core business. Kellogg partnerships with top companies, such as Microsoft, deliver customized thought leadership that produces real-world benefits. 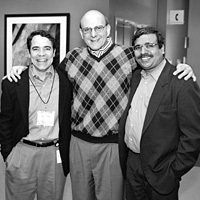 Left to right: Dave Perry '88, Microsoft CEO Steve Ballmer and Kellogg Dean Dipak C. Jain. Since Motorola spends some $4 billion each year on research and development, the financial implications of the research are critical to the company and potentially worth billions, says Toby Redshaw, Motorola’s corporate vice president of IT strategy, global e-business and architecture. Jonnalagadda will present his research results to the company this spring. “My job is to transform IT at Motorola. To do that I have to engage people who will challenge me,” Redshaw says, adding that Kellogg students have proven smart, capable and unafraid to tackle problems in new ways. 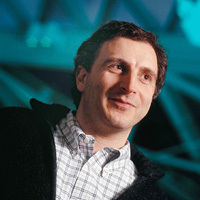 Andrew Bockelman, also a Motorola Research Scholar for 2002, used his project to explore Web services, an emerging paradigm for managing information technology. Another of Kellogg’s partnerships began when Mark Jeffery looked to Teradata to help him put together cases for the new Kellogg class on IT portfolio management. Jeffery’s research on how to use real options to value enterprise data warehouse — the company’s product — evolved from the relationship. “It’s quantitatively difficult, but it has a lot of value. No one else has done valuation of this kind of system,” he says. Teradata also has sponsored Gulati’s research on the critical enablers for companies that successfully implement enterprise data warehouse systems. Gulati is working on a benchmarking survey that will help determine what these companies’ best practices are. At present, he notes that as many as 60 percent of firms with CRM type applications in place are still not getting the total value from it, a fact he says illustrates the importance of aligning the technology with “massive organizational adjustments” to deliver results. While much of the attention during technology’s first wave focused on the consumer sector, Kellogg experts such as Sawhney say the potential for innovation to transform the business-to-business quadrant is enormous. Sawhney cites innovations, such as fuel cell technology, which promise to be huge. He notes that Iceland is already taking steps to make their country nearly free of fossil fuels within the next 10 years, turning instead to wind power. Optical networking and interactive TV are also increasingly close to being marketable realities, and he reports that interesting developments in telemedicine, particularly in diagnostics, deserve attention. Wireless applications may soon allow companies to track containers, the location of vehicles or other elements in a supply chain using tiny sensors — some as tiny as dust particles. Chopra is enthusiastic about such possibilities, but like Sawhney warns that the technology must be integrated properly for maximum benefit. With that caveat, Chopra sees Collaborative Planning Replenishment and Forecasting technology having a big impact by allowing companies to collaborate across the supply chain. This technology is not new, but has habitually been underutilized. The reasons tend to have less to do with the hardware than they do with people. At San Jose-based Redback Networks, a player in the telecommunications equipment marketing place, Manish Gupta ’00 is also focusing on the integration of existing technology rather than looking too far into the future. Gupta, director of marketing and business development for Redback, notes that technologies such as ERP, CRM and distributed computing were widely believed to deliver significant savings to customers in the late 1990s. Today, he says the data suggest a more limited impact. He contends the challenge for marketers now is to better communicate the benefits of technology to their clients, instead of relying completely on CRM. For that, Gupta notes, even general managers need to understand the technology. Ron Swift, vice president of strategic customer relationships for Teradata, looked to a Kellogg partnership to ensure his company's data warehousing products meet customer needs. 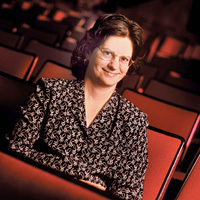 Similar thinking is at work in the data storage space, according to Blake McConnell ’98. 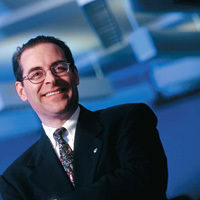 As business development manager for Mountain View, Calif.-based Veritas Software, a leading provider of storage software and data management solutions, McConnell works with companies such as IBM to develop partnerships that deliver high availability solutions to enterprise customers, by increasing performance and filtering out data that’s redundant or noncritical. To achieve this goal, he says, many companies demand that the solutions use the firm’s existing infrastructure. Philipp Afèche, assistant professor of managerial economics and decision sciences, thinks that information technology holds much potential as an enabler for optimizing business processes, ranging from procurement and distribution to targeting customers and revenue management. Now that the dust has settled, people focus more on using information technology to improve their business. But solving problems and transforming key processes using technology may seem more straightforward than it actually is, he says. Ron Swift, vice president of strategic customer relationships for Teradata, agrees that technology, used well, separates top performers from the rest of the pack. Teradata helps companies integrate multiple data channels to get one view of their customers using the enterprise data warehousing approach. “Technology can make a significant difference when applied to creating business intelligence and making timely, more effective decisions,” Swift says. Teradata’s systems have made it possible for airlines to phone frequent customers with the news their flights will be delayed. They allow cell phone companies one last pitch to keep disgruntled customers by giving call centers information they need about length of service, repair history and plan volume. Banks, retailers and suppliers have been other big winners. But one of the barriers companies often encounter when they try to implement sophisticated systems, Afèche says, is the amount of information involved. While collecting volumes of data is now virtually effortless, using the information to increase sales, serve customers better or improve a product is not so easy. Afèche aims to help Kellogg students sort through the complexities with a course he will develop. Students who register for this future offering would take a key set of business problems and decide on appropriate analytical methods to solve them. “It will be a course that focuses on the systematic selection and use of analytical tools and decision support technologies to improve business processes,” Afèche explains. Paoni says one way companies have begun using technology to their advantage is by redrawing the boundaries of their firms. Among other things, modern information systems allow companies to keep a tight rein on product quality data and communicate changes in product design quickly to the manufacturer. Paoni urges students to separate what he calls “little pi” thinking from “big PI” thinking. The former refers to “process improvement,” or making an existing process faster, better or cheaper, while the latter means “process innovation,” or starting from scratch. During the next wave of technology, Paoni predicts firms will move beyond what he calls “yesterday’s thought processes,” freeing them up to redefine their companies. 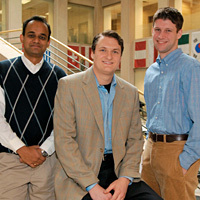 Motorola Research Scholars Shantaram Jonnalagadda '03 (left) and Andrew Bockelman '03 (right) with Robert Wolcott, a research fellow in the Kellogg Center for Research in Technology and Innovation. And lest anyone count out the Internet as a way of doing business, Sawhney says that would be a mistake. While the tendency during the medium’s high-flying days was to overestimate its potential, these days the pendulum may have swung too far in the opposite direction. Biotechnology may be one of the areas that best illustrates both the promise and the challenge of a high-tech future. While stem cell research and “personalized medicines” specific to an individual’s genetic makeup provide hope for a time when diseases will be erased from the genetic code, getting there is not so simple. Producing just one new biotechnology product takes an average of 10 to 15 years and about $800 million, says Löffler. What’s more, winnowing the truly revolutionary from the duds is a process that takes years and millions of dollars. Just one in 10,000 attempts to produce a new product is successful, and only one of three drugs ever recovers the cost of production. Biotechnology companies traditionally have been extremely dependent on capital markets for funding. Start-ups, especially, are feeling pains from investors’ low tolerance for risk, which has plummeted along with the NASDAQ. That reluctance to invest might limit the number of promising therapies in the pipeline. “The value chain of innovation is extremely fragile. If any of the links of that chain weaken, the innovative fabric in the U.S. will disappear,” Löffler says. The critical question for Kellogg experts is, “What does it all mean?” How will businesses use the Internet, wireless communication and other new technologies in the future? Early on, people envisioned radio as an alternative to the telephone, a method of point-to-point communication between ship captains, for example. And the pioneers of the Internet thought they were creating a tool to link universities and research centers. But marketers have a history of quickly figuring out ways to channel technology into new uses, says Kotler. Radio, they discovered, could broadcast product advertisements to millions, and phones could be used to reach customers at home with a sales pitch. That marketers now use the Internet to interact with communities of their customers, gather sophisticated demographic information and promote their products shouldn’t come as a surprise, he says. But it’s equally important to tend the fire of these possibilities. Kozinets cautions that technology appeals to our desire to be more than our nature allows — the old Faustian gamble. What is the impulse behind the Internet, for instance, but an attempt to be omniscient, to know everything and be connected to every place at once? Technology-as-Trickster can lead humanity down as easily as up, notes Kozinets, who hardly considers himself a technophobe. Yet he believes that the desire for transcendence that is part of our love affair with technology can prove destructive. “Ultimately, it’s an urge to transcend our bodies. It’s very artificial — in the literal sense of building artifice — and that can be very alienating,” he says. Whatever the future holds, one thing is for certain. Technology will continue beguiling us with promises that will demand leaders whose skills are even more formidable than those of Aladdin, who found he had to compel the genie in the lamp to keep its word and deliver the treasures pledged.